We went to bed last night with the barest trace of snow on the sidewalks, the Moon hazily visible through thin clouds overhead. 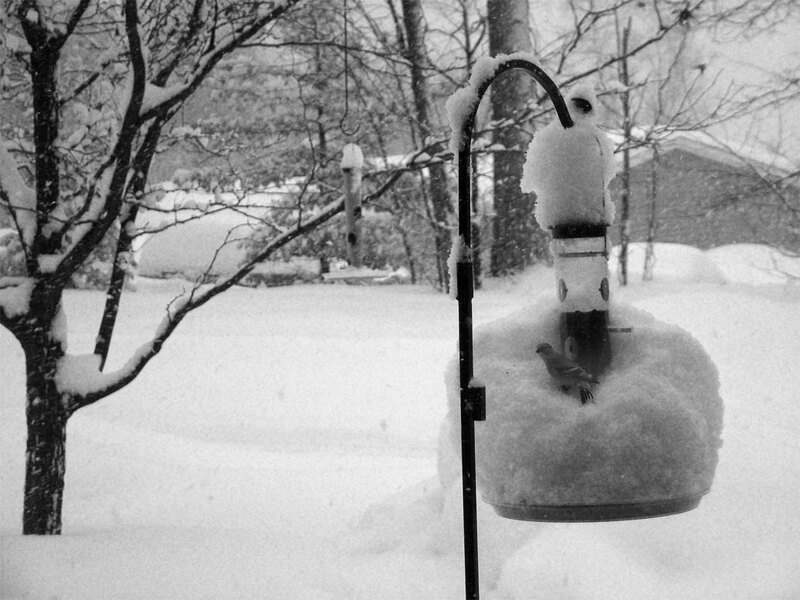 We awoke at 6:00 this morning with about eight inches of fluffy snow piled everywhere… including on the formerly-clean seed trays of the bird feeders. Thank goodness the snow was relatively light and fluffy due to the 15-degree (F) temps. But there was so much of it! Lots of fluff can still be a lot of work, fuss, and bother. In the picure here a tiny finch, one of our first visitors of the day, is nearly lost in the accumulated snow collar on the thistle seed feeder. The feeder in the background? I cleared off the tray when I was out shoveling. We thought this was going to be an easy weather week… Sheesh! Ha! Better you than us! Not really. Sorry you got more snow. I know you don't need it. At least there isn't drought. Glad you helped the poor wee birdies out. Good on you.